So I finally attended what should be my first book presentation (bookworms Oj-Uknaija and co. shift, make a little room for me to the left :)). 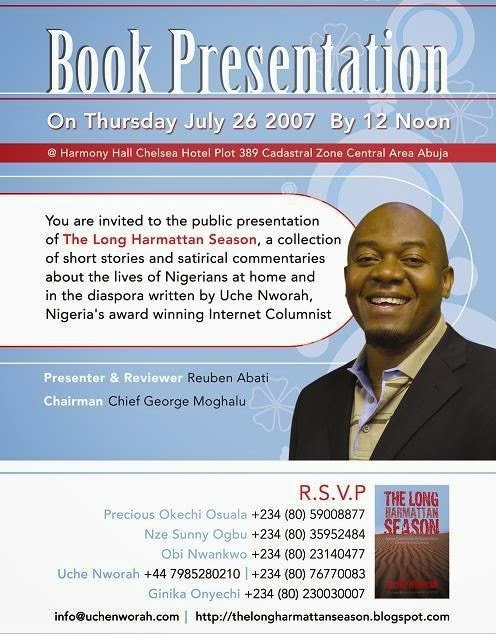 It was Uche Nworah’s “The Long Harmattan Season” Abuja book launch held on the 26th of July at Chelsea hotel. It’s basically a collection of the articles he’s written over the past few years as an internet columnist. Having narrowly missed his wedding two years back I couldn’t afford to miss this one as well; the brother has been one of my blogging inspirations! Being a true son of the soil I kept to Nigerian time attendance wise, thus I missed the review by Reuben Abati. But it was still enough for me to come to the conclusion that the presentation was great as a whole. I liked the caliber of guest and the event’s organization, although the attendance could have been much better. The MC for the day a bosom friend of Uche was cracking us up non stop and all others who spoke (bought a copy/copies of the book and supported the course) had nice things to say about the author. I Impressed myself by giving a nice commendation speech (I wonder if that’s enough to get me on TV) after which the good times rolled as I grabbed a copy of the book which Uche duly autographed and then graciously posed with him for the paparazzi :). It was nice finally getting to meet the brother and physically giving him my regards and having him acknowledge such. By the way I was at the event with fellow blogger Josh from “What It Is”, who was a really good friend on the day as he saved me from some potentially embarrassing situations. 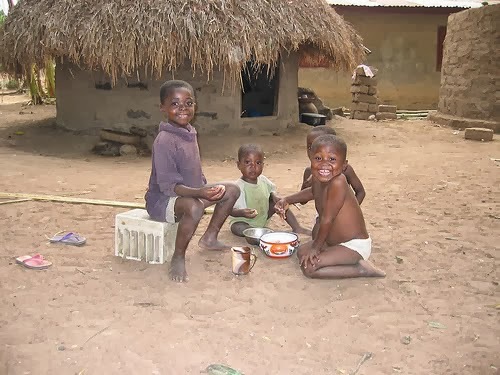 The sad side to the whole thing though was that Uche was attacked and robbed some days earlier. Materially he lost a lot but luckily and more importantly he came out alive and with just a cut on the head. That explains the plaster he had on at the event. I guess that’s it for now so I can get back to reading the book (my my, the packaging is top notch unlike a lot of Nigerian novels, anyway it was printed abroad so I guess that’s to be expected )…although I have already read quite a number of the articles online. That reminds me since it’s a “blook” a lot of the colourful online responses (comments) to the articles will be missing…how sad. You know we who are familiar with the guy know that he’s great with the pen but does at times allow his emotions to come too much into play thus considerably reducing the substance of his writings. The event flyer; I’m waiting for Uche to upload the pictures and give his take on the event so that I can give this post some proper footing.